I've been teaching basic woodcut technique in various settings since 1993, with the specifics of what I teach linked to the situation. The first few times it was in the 2D classes I taught as a grad student. Mindful of the economic situation of the typical college student (which I was, and only 4 years removed from my undergrad years), I showed the students how to create images in the same lauan I used, with inexpensive and easy to find x-acto blades. The same still goes for the 2D classes that I've been teaching at my colleges for the past 8 years. In 1998 I taught my first multi-day workshop at PCNJ, which had a box of inexpensive relief tools that my students could use during our sessions if they didn't have their own. I've taught that workshop maybe 3 or 4 times since then under the same conditions. Did one like that once at the Hunterdon Museum, where they had a deal in place where participants could arrange to purchase a basic 5 tool set, that would be waiting for them on the first day (a few did), and providing a small assortment of beat up relief tools for those who had nothing else. Since the moment I took my current Studio in Ocean Grove, I had always considered the possibility of using it to teach woodcut, but a couple of things held me back. One was that there hasn't been an overwhelming demand by people looking to take such a class, and the attempts Molly and I have made to publicize such opportunities haven't brought in many people. The other thing was that for me to conduct my own class, I'd have to be able to provide everything needed- wood, paper, ink, and cutting tools. The first three I usually have anyway, but the only tools I have are my own personal set, which I value highly and I don't lend out to anybody. At any point I could have invested in a supply of woodcut tools, but that's a bit of money to put out with no guarantee that a class would follow, so I put it off. But that all changed in recent months. Over the summer, people at the BAC asked me to consider teaching a woodcut class for them. And someone local ran across my website and contacted me to ask about classes I might be teaching in the area. Seemed like a good time to finally commit. The BAC would advertise it to a much wider group of people than I could ever reach, and the space is large, uncluttered, and climate controlled. We put it on the schedule and I started doing some tool research. There are basic five tool sets (knife, chisel, v-gouge, small and medium round gouges) available from a few sources, reasonably good tools, usually around $45. I could buy a few of those, but the knife and chisel tools don't really get used much, so it seemed a waste of money. Some of the American made tools were available individually, but they were even more expensive that way. My best tools are Japanese imports, and I found that my supplier had a wide range of individual tools available at different costs. The type that I use go for $40-$50 each these days, but they have other less expensive lines. I waited to see how many students I'd actually have (and thus how much money I could budget), and ordered 9 tools of the types I find most useful. Those tools arrived today. I gave them a quick test on a piece of scrap wood and they're super sharp. They'll get put to use next week. I ended up using a big chunk of the money that I'm making for this class to buy the tools, but I'll have tools I can use for classes for years to come. Hi there. I've been reading your blog with interest. I am mostly an etcher but want to expand to do more relief work. I'm interested in the source of your Jap tools..is there a brand you'd recommend...good ones but not the very most pricey? I get my tools from a place called McClain's, which is located in the Portland, OR area. Easily found on the web. They import them- I don't know who actually makes them. I favor their most expensive line, the two part tools (handles open so that blades can be replaced), which these days go for $40 to $50 each. I've had mine for over 20 years, still using the original blades and they still work great. For my local class I bought tools from their least expensive line, the Namisei, or standard quality tools. Individual tools are in the $15-20 range. 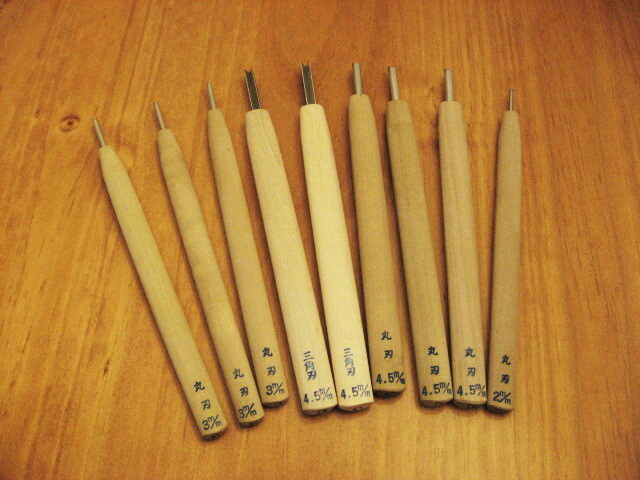 They come with long handles, but you can cut them down to a smaller size if you like, and most of my students have. They have a few discounted sets, but if you just want to try a few, I recommend the 3.0 and 4.5 u-gouges and one v-gouge. Good luck, and welcome to the world of woodcut.